At the end of the 19th century medical care was based upon the thought that disease was the result of poison and that the poison should be removed by bloodletting and purging. Liberal doses of calomel frequently brought death, but the belief in their value persisted. Complaints about physicians were common, and during the antebellum period the quality of medical education in the United States was poor. Medical schools fell into two categories, university and proprietary. They offered a similar curriculum and faced the same difficulties, but because of their dependence on student fees proprietary schools were commonly known as diploma mills. Usually no premedical training was required, and laboratories and libraries were seldom available. The apprentice system was used and young men learned the art of healing by studying a "winter or two" with an established practitioner. It wasn’t until 1865 that the first medical school in Texas was established. This was the Galveston Medical College, organized in November 1865. Poorly equipped, the school closed in 1873 after the faculty resigned in protest. It was reorganized that same year as Texas Medical College and Hospital. At this time there were only about 2690 MDs in the state and only 10% of them belonged to the state medical association – 269 MDs belonged to the state medical association. In 1881 the legislature established a state university with a medical department at Galveston. Anticipating a new and state-supported school in town, the Texas Medical College shut down. On September 14, 1882, Bartlett Joshua Palmer is born. His mother dies soon afterward, and D. D. Palmer “soon married” his second wife. In 1886 Iowa passed a medical practice act, though the law had rarely been enforced, perhaps owing to the public's continuing reluctance to accept the exclusive authority of any one branch of the healing arts. Orthodox medicine was only beginning to establish its scientific authority; the first randomized, controlled clinical trials of pharmaceuticals were still nearly four decades in the future. The next year D. D. Palmer leaves the grocery business and is studying magnetic healing with Dr. Paul Caster of Ottumwa, Iowa. After graduating, he establishes practice in Burlington, Iowa. The Texas legislature could not provide the funds for the new medical school that was authorized in 1881. Galveston business interests and some physicians in 1888 reopened the Texas Medical College "to fill the gap until the university could begin its operations." It closed for the last time in 1891. Construction of the "Red Brick Building," headquarters of the University of Texas Medical Branch and a landmark in Galveston, began in 1890 next to John Sealy Hospital, which had opened that year. The original faculty in 1891 had thirteen members; eight were full-time. But the facilities were lacking. After the Galveston hurricane of 1900, the school received much better support and began a long period of expansion and development. Frank Dent was a physician of the Eclectic sect, a group which accepted and taught the conventional medical science of the time. However, in the area of therapeutics, the Eclectics carried on a rigorous campaign against excesses of drugging and bleeding, which were still practices used by many physicians at the time. In addition, all but one of their medical schools were open to women. Dent had been in practice for six years when he was convicted under an 1882 West Virginia law which required physicians to hold a degree from a reputable medical college, pass an examination, or prove practice in West Virginia for the previous ten years. In this case, the State Board of Health refused to accept Dent's degree from the American Medical Eclectic College of Cincinnati. The University of Texas Medical Branch medical school opened October 1891. The Ashbel Smith building, called “Old Red”, was where Galveston’s Medical School was established. Because standards were high and students poorly prepared, only twelve of the first group of twenty-two medical students eventually graduated – a 54.5% passing rate. An amendment of the TMA’s constitution in 1893 permitted membership to female physicians, but not to black doctors. Having discussed anatomy, physiology, and healing extensively with D. D. Palmer for about a decade, Willard Carver decides to announce a new system of healing and made plans to announce it to the world on January 1, 1896. However, on September 18, 1895,D. D. Palmer successfully adjusted the spine of Harvey Lillard. Less than a week later D. D. Palmer writes Willard Carver describing the first adjustment in detail. Palmer was 50 years old and B. J. Palmer is 13 years old. By the late fall of 1895 D. D. Palmer had developed four methods of adjusting the vertebrae of the spine. On December 10, 1895, Willard Carver began the study of chiropractic. He claims to be the “developer of the scientific aspects of chiropractic while defending and upholding D. D. Palmer’s claim of being its discoverer. D. D. Palmer writes "Medicines and medical doctors are necessary; we cannot get along without them”, but Palmer minced no words in condemning what he thought were primitive and hazardous methods. "For many years there has been growing in the public mind a suspicion that medicine is not a science, but that it is most experimental guess-work.This ancient system of poisoning the sick has a lawful right to fill our poor-houses … and asylums with their poisoned victims. They are dosed with stimulants, sedatives, and narcotics until they must continue their use, even to self-destruction. These misguided unfortunates, half-living witnesses of medical incompetency, can be seen everywhere. … People have been led to believe that all medical laws were made for the "protection of the public against quacks." But the facts are, that these laws are usually framed by professional quacks for their own protection. These laws decide what school of doctors you shall employ. A diploma from one of these favored schools will protect any opium or whisky-soaked quack of that profession to poison and butcher unmolested…"
Near the end of the century D. D. Palmer listed as a member of the faculty of the Independent Medical College of Chicago during 1897-98. He writes: If Health Boards were what their name implies, they would utilize some of their fondness for law by getting out injunctions against manufacturers of anti-toxin, instead of endeavoring to force this dangerous fad upon us...We are sick and tired of the monopoly of drugs and the ruling of medicine .... Laws should be made to protect the people, not a particular class or school." The first portion of the constitutional provision above quoted confers upon the Legislature general power to pass laws (1) prescribing the qualifications of practitioners, and (2) to punish persons for malpractice. Continuing the same sentence, the latter part of the provision subtracts from such otherwise general power — the word "but" being used in the sense of "except" — by prohibiting the Legislature in such laws from inserting any provision making a distinction in such qualifications or punishment on account of the "school of medicine" to which any of such "practitioners" or "persons" may happen to belong. The first portion dealing solely with "qualifications of practitioners" and "punishment," and there being nothing in the context to indicate that the latter portion was intended to embrace any wider range of subjects, we must give it the effect, indicated by its situation and close connection with what precedes, of being merely a limitation upon the previous general power of prescribing "qualifications of practitioners" and "punishments." Therefore it should not be construed as intending to control the Legislature in the entirely different matter of prescribing the qualifications of members of the "board of medical examiners." 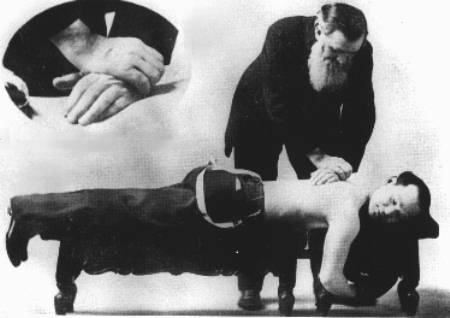 In 1898 D. D. Palmer teaches LeRoy Baker enough chiropractic to treat his injuries from an accident at a railroad crossing. William Ambrose Seeley MD, a homeopathic physician, paid D. D. Palmer $500.00 cash for a period of instruction covering 8 to 10 weeks, and he goes in the history books as the first paying student of chiropractic. The occasion marks the beginning of the first chiropractic college. In January Other students of D. D. Palmer in 1898 include Texan Andrew P. Davis, MD, DO, who may very well be the first chiropractic doctor in Texas. Dr. Davis, one of the leading practitioners of the homeopathic system of medicine in Dallas county. His father was a noted physician and was recognized as a profound scholar and deep thinker. Dr. Davis first made an exhaustive investigation of the eclectic system, after which he turned his attention to allopathy practicing that system of medicine for about eleven years. He began the study of homeopathy and ophthalmology. In about 1879 he moved to Corsicana, Texas, where he was the pioneer homeopathic physician of that place, and successfully and favorably introduced that system in that community. In the spring of 1880 he settled in Dallas. In 1898 he graduated from D.D. Palmer’s School of Chiropractic and returned to Texas. In 1898 the home phonograph became popular, and on September 8, 1900 a powerful hurricane hits Galveston, Texas, USA killing about 8,000. The same year L. Frank Baum publishes The Wonderful Wizard of Oz, and Rudolf Diesel demonstrated the diesel engine in the 1900 World’s Fair. Medical schools multiplied at the turn of the century in Texas. Two, Baylor University College of Medicine and the University of Dallas Medical Department, were organized in 1900; the later gave rise to Dallas Medical College in 1901 as a result of a faculty dispute. At Texarkana, Gate City Medical College was started in 1902, and another two Dallas schools, Bell Medical College and Southwestern University Medical College, were founded in 1903 and 1907 respectively. It appeared that the founders of these schools had the best intentions to offer bona-fide instruction in medical science, but they had too few resources. Most of them ceased operations or were absorbed by other schools within a short time. The American Medical Association had other plans for medicine and medical education, however, and shortly after the turn of the 20th century the birth of organized medicine was accomplished.